Of course we want to teach our children that Thanksgiving is the time when we stop to appreciate the loving people and good things that we have in our lives. At our Thanksgiving table, we have the tradition, before we start eating, of going around the table and naming the things we are each thankful for. This little exercise brings the holiday into focus and as my grandsons join the table, I am thankful to be able to share this tradition with them. While spending time with your loved ones, Thanksgivings is a great opportunity to help your children practice important school readiness skills. If you are in charge of the holiday meal, as I am, then you will be visiting the grocery store several times in preparation. The bags and bags of groceries you bring home can provide items for practicing math skills in a fun and unique way. Counting – Explain to your child that you will be buying more food than usual as you prepare the Thanksgiving dinner. Ask him to count the number of items that you bring home from each shopping trip. You or your child can write the number on a piece of paper with the date of the shopping trip and compare it to the amount you buy on another trip to the grocery store. Then, encourage your child to practice counting backwards he helps you put the cans, jars and boxes into the cupboard. Pattern making – The cans, boxes and jars you have at home can now be used to create a pattern. Tell your child to make a pattern using the basic shapes of the items as his guide that repeats several times and then you can try to guess the pattern. Children can have fun as they create a long pattern that extends across an entire room. This is one time when it is okay to put food on the floor! You can try some fun Thanksgiving math worksheets with your child, which use colorful Thanksgiving-themed pictures to really capture a child’s attention. If your child is not interested in math concepts, you can try using more general Thanksgiving worksheets to spark his interest. 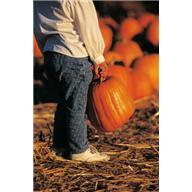 Pictures that represent the Thanksgiving holiday can make worksheets seem special. After all, these are appropriate for just a few short weeks each year. I wish you all a wonderful Thanksgiving holiday with your family and friends. Great tips! My five year old loves to make patterns with everything. I might have to try your grocery pattern game with her.